The dad who is a Type 1 diabetic dad. The dad part comes first. Has since my son was born and always will. Even when I’m checking my BG before holding and comforting my crying son, I’m doing it in the best interests of my son, and I think most diabetic parents are like me. When it seems like we may be looking out for ourselves, we’re more than likely looking out for our children and loved ones. Sometimes it’s not easy to look out for ourselves first, diabetic-wise. We have obligations, responsibilities that can compel us to ignore a hypo sign, push it a little further, skip a snack. We do so at a high risk and dangerous outcomes. And in order to ensure we’re taking care of our obligations and responsibilities, we first need to take care of ourselves, without guilt or fear or stress. It’s a paradox of sorts, but it’s what we face, day-in and day-out. And if those around you don’t understand, explain it to them. Ironically enough, in these days of openness, privacy, especially about medical issues, keeps a lot of people from asking and learning about you and about me. And that’s what’s most important. Not the latest in treatments or trends or predictions or forecasts, but my life with diabetes and your life with diabetes. But today, although I checked my BG the normal number of times, bolussed and basaled the same ways and ate along my normal carb guidelines, I especially felt like the dad who is a Type 1 diabetic dad and the dad of a fine, special boy. I feel that way everyday. Happy Father’s Day to all the diabetic dads. Sometimes I feel that we as diabetics, especially type 1 diabetics, may come across as a little ungrateful for all the advances made in the struggle against diabetes. One hundred years ago, I wouldn’t be alive. Chances are, if you’re a type 1 diabetic , you wouldn’t be either. I’m grateful for all the advancements, all the technologies, as annoying as they can be sometimes, that give me another day with my loved ones. Even in the last thirty years, I am grateful for technologies like the infusion pumps that have led to better treatment, better outcomes, and better lives. I don’t think there aren’t many type 1 diabetics or families affected by diabetes, who aren’t grateful. Granted, there are parents of type 1 diabetic children, who rightfully wish they could do away with this insidious disease. But the advancements have been phenomenal. I wonder if there is another disease that has shown so much improvement in the ways of treatment and outcomes? I doubt it. Sure, we see a lot of things we think could be improved upon. Nothing is perfect. But we’ve come a long way. I find myself grateful to all the medical researchers toiling away in labs, the medical professionals seeking new ways to help us, and the clinical trial patients who have volunteered to help make our lives and future lives better. I often feel we don’t thank those people enough, or at least I don’t. Thank you. Exercise is usually good. It can boost our strength, our self-confidence, and, as a result, our spirits. For the T1D, it’s not immediately rewarded, but it can be immediately punished. For the race, the mile, or the set of reps, we can feel normal and back in control. But our bodies are anomalies. Exercise is often punished. I found this out shortly after being diagnosed with T1D and working out as I had before. Big mistake that resulted in a trip to the Emergency Room. I had to realize what my body wanted to do and adapt, and what my artificial insulin wanted to do. And adapt. Insulin is a high-alert medicine. Not the only one, but a big one. High-alert medications are drugs that bear a heightened risk of causing significant patient harm when they are used in error. Although mistakes may or may not be more common with these drugs, the consequences of an error are clearly more devastating to patients. The crazy thing is that usually inactivity is more immediately rewarded than activity. Nevertheless, many of us play it, run it, and risk it, because we know it makes us feel better. And that may be more than half the battle. Alot more. Just check, check, and check, and then risk it. As I adjusted to my new life of wearing an insulin pump and starting a new job, I realized I had some new fears and factors to deal with. Although I had recently completed graduate school and had added extra certifications, I felt that I lacked confidence necessary to deal with my diabetes management and a new job and career. My biggest problem was fear of the unknown unknown. And I believed that the best way to deal with that fear was to face other fears often involved when we seek out new endeavors and our interests. A case in point was flying. I have always enjoyed flying, while realizing the inherent dangers and risks, as most of us do. I have never been to fond of static heights. As a history teacher, with a focus on World War II, I also had a special interest in Naval and Army Air Corps aviation of that time period. So as I wound down my graduate studies, I decided to take a trip in which I would visit several aviation museums and experience part of the history I had spent my life learning about. I could also face some fears. 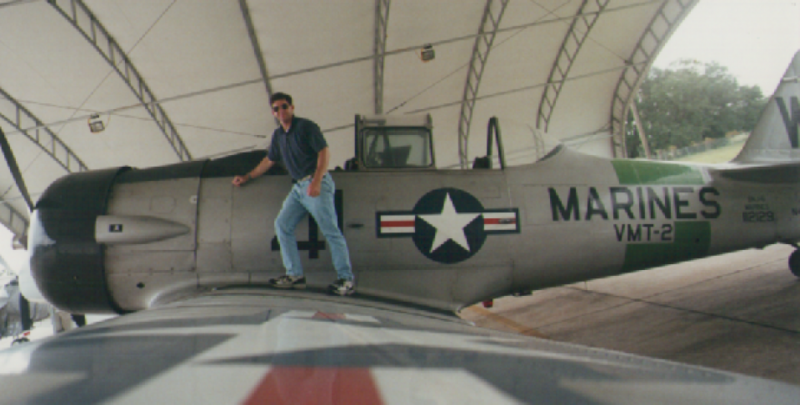 While in Central Florida, I decided to do two things: take a playflight in a vintage AT-6-SNJ and take a ride in an open ultra-light aircraft. In the AT-6 I was able to experience loops, barrel rolls, airelon rolls, and wingovers. The ultralight gave me the experience of an open cockpit that many of the early aviators had. Next to being married to the love of my life and holding my son, flying in these planes was the greatest thrill I have known. Yet, I also had fears. Being inverted 5,000 feet off the ground and flying in a contraption that felt much like the aluminum chairs of summer patios brought a sense of fear that could have been overwhelming. But I faced my fears as calculated risks, which helped me face my fears as a brittle, Type 1 diabetic, turn the fears into calculated risks, and try to manage them appropriately. I feel a good deal of the problems that we face are based on fears that can be overcome if we act rationally and intelligently. My pictures on the left and at the bottom of the page are from my trip. Make no mistake that this blog is about being the best father I can be for my son and dealing with diabetes. Although you will not find pictures of him here, those I share with family and friends at family gatherings, or at work, or through the magic of Facebook; being a father and husband are what define me. Having T1D is a part of me and is my diagnosis, and in many ways, as Kerri Sparling says, explains me, it does not define me. Granted, it plays a huge role and can have a great effect on me, what has a greater effect on me are my son and wife, my family and friends. They are not just accompaniments in my life, they are my power sources, my raison de’etre. What I hope to find through this blog are better ways to be a better and healthier diabetic and a better father, and to perhaps help others in my situation to do the same. So make no mistake about it, what this blog is about, despite the lack of pictures, is what Ronnie Milsap describes as his …sunshine day and night, ohh what a difference you’ve made in my life. My son and wife. My family. While I rocked my son to sleep tonight, I remembered what a small, and at the same time, a big factor diabetes is in my life. A challenge that can be deadly, even during those times I’m acting as if I don’t have it, and trying to forget I have it. It has strengthened me, like others on here I’m sure, while at the same time it has weakened and tried to kill me. In fact, the harder it tries, the more we seem to pay it little or no heed in living out our lives. From my wardrobe of vests and jackets, with their numerous pockets for snacks, glucometers, and back-up strips and supplies, to the various ways we have for dealing and facing our fears, most of us probably have stories of how dealing with this disease has given us an edge in confidence. Dealing with a disease, a life event, and life itself, is a two way street, and how we respond or react is half the battle. And while admitting that is a mixed metaphor, to try to explain it another way might make it tough to chew on. So on we go, embracing the seriousness of the disease, while trying not to let it seriously affect our life choices. And that is the conundrum we face throughout our lives yearly, monthly, weekly, daily, and alas, even hourly. Is there a New Way of representing diabetics as a group who are living and achieving, yet challenged? For a long time the word “cancer” was associated primarily with “victim” or “patient.” Now thanks to medicine and new treatments, we often hear “cancer” associated with “survivor.” Granted, we are still losing too many to the scourge of cancer; and one is too many. I have lost too many great friends to that dreaded disease. Yet, we are often celebrating the “cancer survivor,” while highlighting the need for a cure or cures. I believe that this change has been largely a combination of changed perceptions, changed attitudes, and the media. While many battle this dreaded disease daily, there does seem to be a surge of hope. My question is can the diabetic community learn something from this. We not only have many survivors, but many achievers. But I feel many times those achievers are singled out, and they rarely seem to unify as a group. Would that help us, if they did? You have to do, what you have to do. No apologies should be necessary. If I had a nickel for every time I have apologized (for managing my hypoglycemia, for example) for taking care of myself and relieving others of the burden of doing so…I’d be a rich, rich man. And yet I often believe many of us feel this undeserved burden of guilt, because of the perception, among others, and more importantly ourselves, that diabetes, especially T1D, is largely about self management, thereby, resulting in the mistaken belief that if we had done something different, or worse, “better,” we wouldn’t be in whatever predicament we get into. I think we find this perception pervasive even among ourselves. Is it necessary for us to accept the perception of ourselves, as others see us, as if it’s a fact? Is there not a new way of having the public perceive us? A Third Way? I’d like to hear your opinions. The other part of me, being a dadda. As a diabetic and parent, I would love to claim, as other parents do, my child comes first. However, as a T1D, I have to make sure I’m ok, stable, non-shaky, and not tempting a low, before I even think about taking care of my child. So who comes first? Myself. My son. My answer: Myself, because of my son. It’s somewhat difficult to admit (and easy to put myself on a guilt trip) to concede that I must come first, not resulting in putting my child in danger, but in order to avoid putting my child in danger. That’s a simple fact, and not something that should cause guilt. It may not be fully understood by non-diabetics, but in the diabetic world, especially in the T1D world, changes can occur in seconds. Running high to avoid “changes,” can result in long-term complications. And we all want to be their for our kids, as long as we can.